These cupcakes are to. die. for. This is really just the recipe for the frosting, you can use whatever cupcake recipe you prefer. Or just doctor up a mix like me if you're in a hurry. Chocolate cake pairs perfectly with this scrumptious frosting. For the caramel sauce, I suggest making your own, but if you purchase it, get the good stuff, and make sure it's thick and gooey. If you make it, be sure you cool it completely before adding to the frosting, and a few minutes in the fridge will help too. 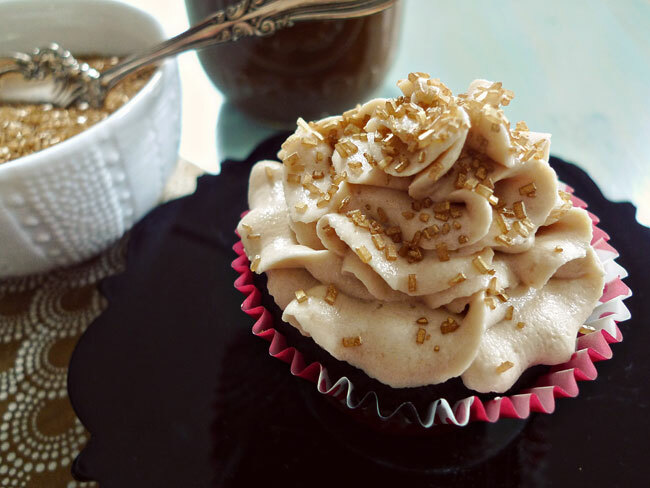 If you would like to add some extra decadence to your little cakes, you can fill them with a dollop of caramel sauce. 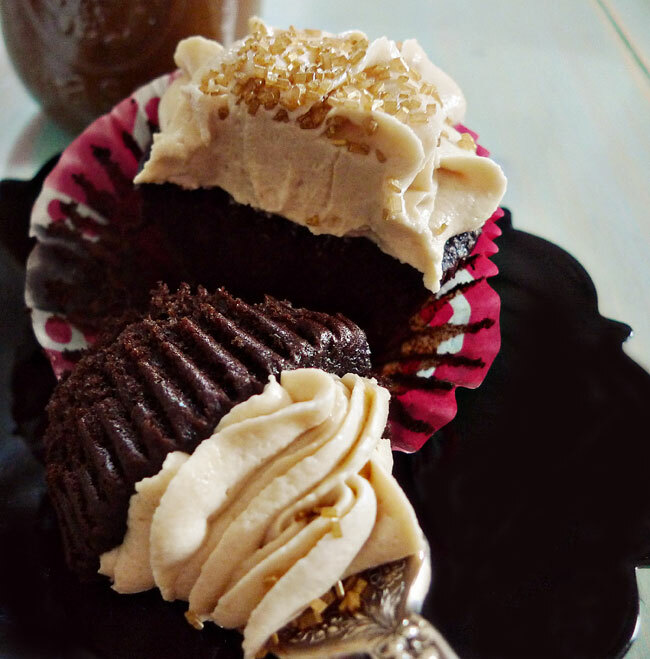 Using a sharp paring knife, cut a small shallow cone shape out of the top of each cupcake. Eat the little cone pieces. Drop a teaspoonful of caramel sauce into the space. See here for a visual. In a a large bowl fitted to an electric mixer, beat the butter. Beat it long and hard, until it's very white and very fluffy. Add shortening, beat until completely incorporated. Beat in vanilla. Add in confectioners sugar ½ cup at a time, mixing on low speed until completely incorporated (it will be quite thick). Add caramel sauce, mix well. Add salt, to taste. Yield: enough to generously frost 2 dozen cupcakes or a 2 layer cake. I like to pipe the frosting with a large flower tip (Wilton 2D) and sprinkle on some gold sanding sugar. Whoah. Those look delicious. Thanks for sharing. Adding this one to my "recipes to try" file. They look so yummy! What sugar was used on top of the frosting?